What is Citizens' Initiative Review? 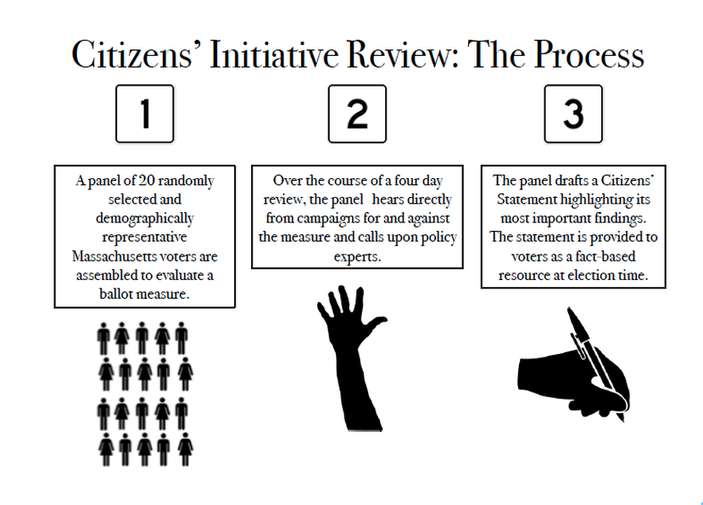 The Citizens’ Initiative Review brings voters together to provide their fellow voters with a clear, useful, trustworthy evaluation of a ballot measure. Under the CIR system, citizen panels representative of the overall voter population conduct in-depth deliberations on ballot questions. The panels hear from advocates and experts on all sides of a question and present its findings in a Citizens’ Statement, which will be placed in newspapers and other media outlets across Massachusetts for the benefit of voters. "Many of us consider [the CIR] to be our most meaningful experience in politics. And for those of us who have struggled to keep faith in the political system, it helped to restore it. Pioneered in Oregon, the CIR has proven to be an effective, well-received way to inform voters about complicated ballot measures. Massachusetts held its first CIR pilot in 2016. The second CIR pilot will be held in September 2018. In 2018, twenty citizen panelists were drawn from a random sample of 15,000 Massachusetts voters and selected to be reflective of the state’s electorate in terms of age, race, gender, geography, party affiliation, and educational attainment. The map above shows the geographic distribution of the 2018 panelists.